Four lamp pendant with drops of clear crystal balls with bubbles inside. Chrome finishing with Silk Silver Shade. This exquisite chandelier is the picture of perfection with its chrome hardware, six candelabra style lights, three layers of cascading crystals and a sheer white lamp shade. The faux silk shade filters light into the room and casts a glow of that is low and dramatic. 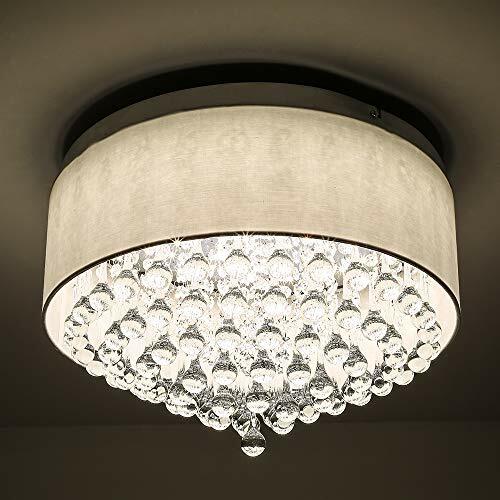 It comes with a 39-inch adjustable chain that is perfect for multiple ceiling heights and room sizes, making this light the perfect addition to any home. 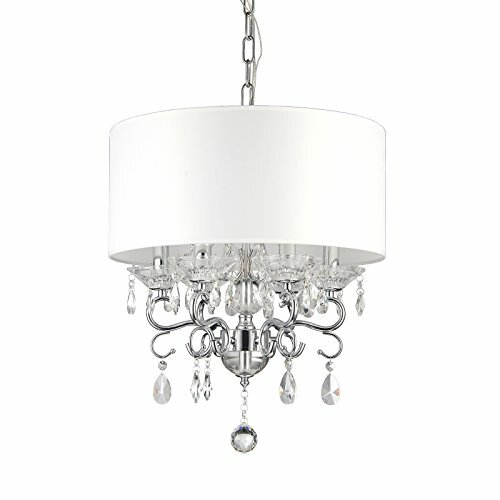 This opulent yet simple flushmount chandelier is a perfect addition to any room that needs a bit of drama. 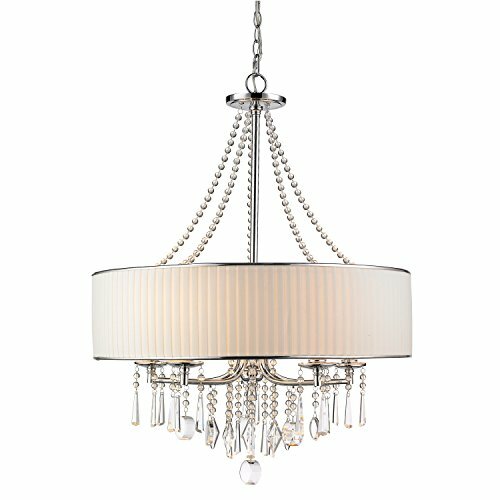 It features chrome hardware; a white tightly woven threaded drum shade, four lights, and a layer of cascading crystal beneath. The light filters a glow in the room that instantly adds mood. 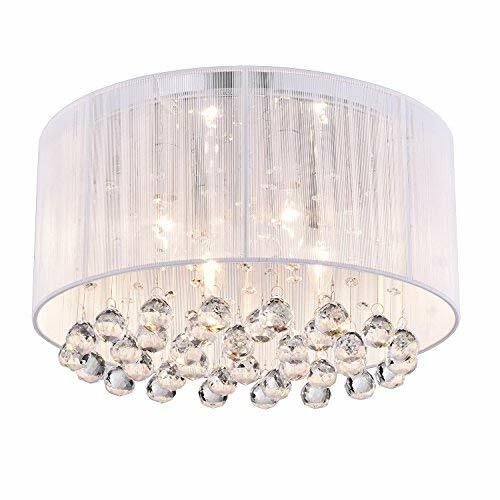 White Drum Shade Crystal Chandelier Pendant Light Complement your modern furnishings with this white drum shade crystal chandelier light that blends elegance with a classic design for a contemporary twist. The chandelier's modern look is enhanced by curving hardware in a sleek high-polish chrome finish. The hardware is crafted from steel for durability and strength. This five-light fixture provides ambient illumination for a cozy atmosphere thanks to the stylish fabric lampshade that serves as a filter. 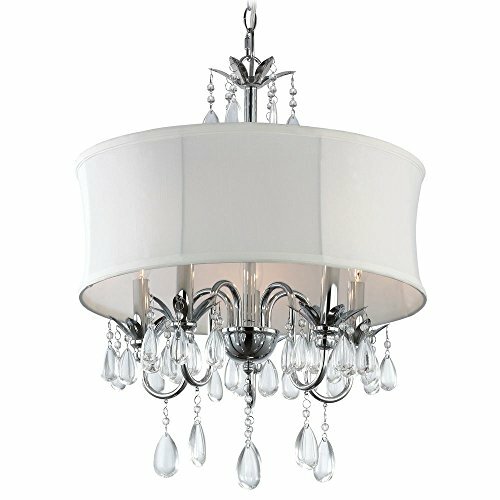 This teardrop crystal chandelier requires five candelabra-base incandescent light bulbs of up to 60-watts each. 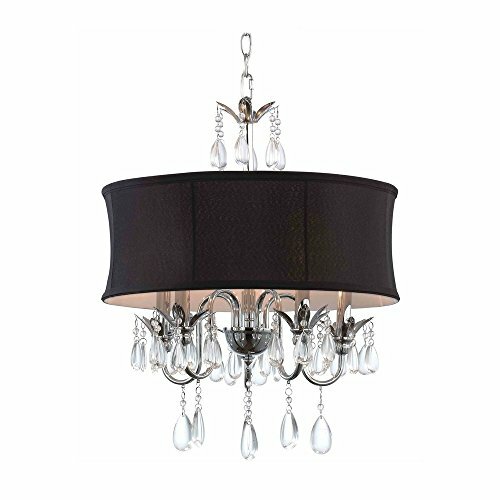 Black Drum Shade Crystal Chandelier Pendant Light Enhance the elegance of any room with this black drum shade crystal chandelier light from Ashford Classics Lighting's Geneva collection. Use the chain-hung hardware to place this chandelier over your dining room table, or hang this stylish light in your entryway to accentuate your modern decor. Delicate crystal accents both over and under the black drum shade reflect the light to give your space an added sense of glamour. This fashionable chandelier requires five candelabra-base incandescent light bulbs of no more than 60-watts each. 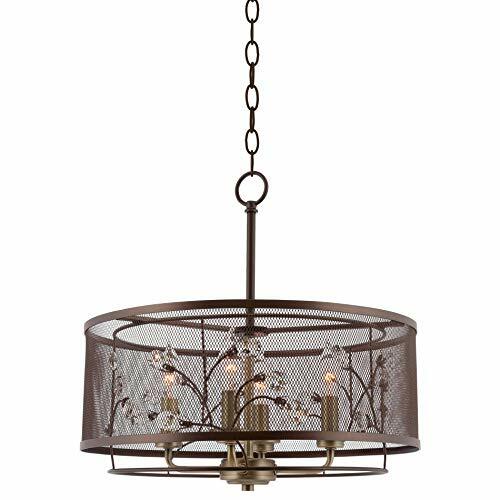 The Bristol 16.5" chandelier features a standout bronze mesh shade design. Infused with lustrous acrylic crystals in an intricate leaf/vine design and added antique brass sockets, this chandelier showcases glamour and style. 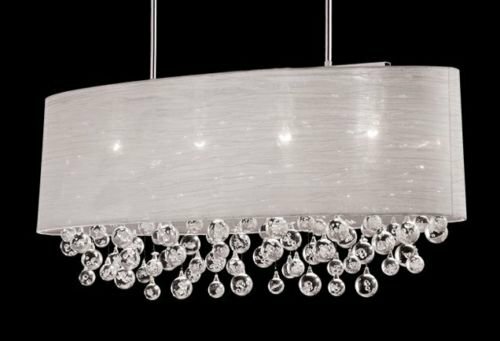 The 4-light design casts a stunning glistening shine that is perfect when placed in any dining room, bedroom or living room. Size: 16" x 90.75" x 16"16\" x 90.75\" x 16\"
Crystal Chandelier Round Drum Shade Semi Flush Mount Ceiling Light Fixture 17"
Watch how I transformed my old brass Chandelier into a more up to date lighting fixture. Want more Drum Shade Crystal similar ideas? Try to explore these searches: Star Bbq Funny Apron, Ammco Negative Rake Brake Lathe, and Avalon Organics Organic Conditioner.